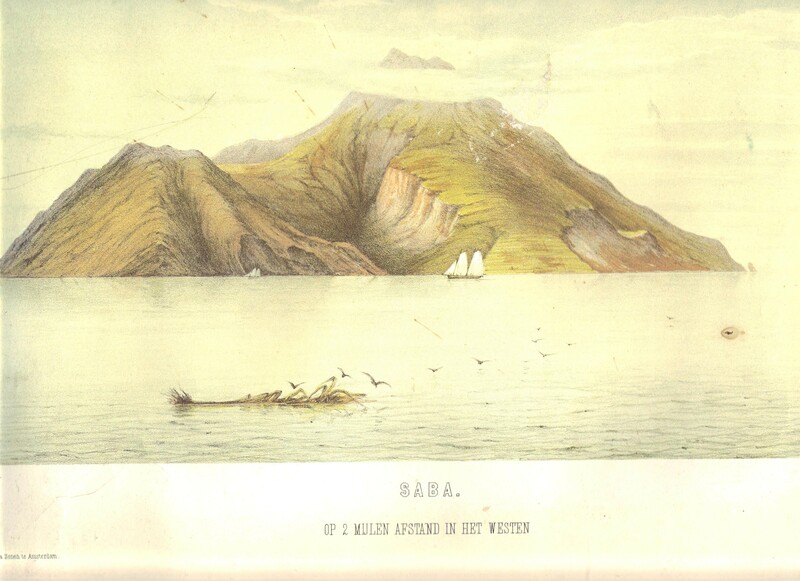 A lithograph of our beloved island Saba. December 6th “San Saba” Day. “Did you know that December 6th is San Saba Day? We hope that if not this year that December next year December 6th will be celebrated as a National Holiday. 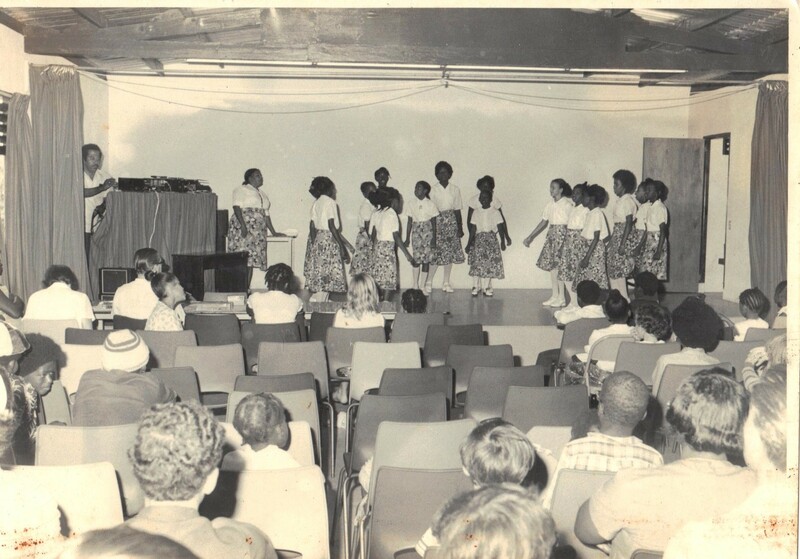 In an article in 1970 I emphasized how important it was for Saba to have its own National Day as was the case with a number of the surrounding islands. A day in which to remember our hard working ancestors of the past. A day in which to showcase our culture and our handicrafts and so on. A day in which to encourage sports and in general to let the world know that we did exist as a people though small yet proud of what we had achieved and were still capable of achieving. This is a photograph of the 25th anniversary of the WIPM party in 1995. I post this one as it includes Calvin Holm, Peter Granger, Ray Hassell, Roy Smith and Elmer Linzey. 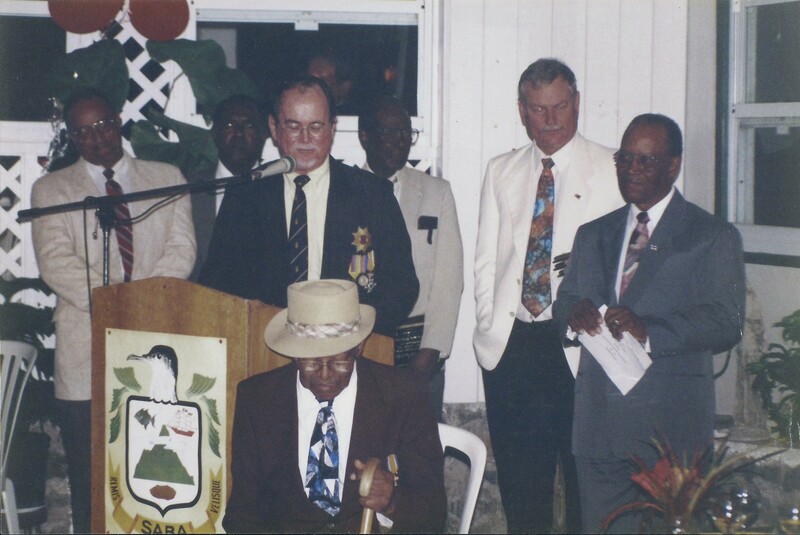 Ray Hassell was the Chairman of the first Saba Day celebrations. Why a Saint one might ask when at the time I was not a very religious person. Would go to church occasionally to admire the pretty girls but that was about it. We were surrounded by Saints. I was living on “St. Martin” neighbour to “St. Barth’s” and in the distance you could see “St. Eustatius” and “St. Kitts” and they all celebrated their respective saints. So I thought it would be a good start to look for a Saint. In the Encyclopedia Britannica there I found a Saint Saba (439 -531). A Palestinian monk, born near Caesarea of Cappadocia. Becoming a monk in his childhood, he went to Jerusalem and lived as a hermit. After a time he established the “Great Laura” monastery in the neighborhood of the “Dead Sea”. There is a lot more but since I intend to write as much as I can on that First Saba Day then readers can look up more on that Saint on the Internet. The well known Mrs. Laurie Hassell winner of the Saba Lace competition for the first Saba Day. Here she is showing a tourist how she did her work. In July 1975 I informed the other Members of the Executive Council of Saba that I did not want any more delays and that this year “self” as we would say I wanted to start Saba Day. 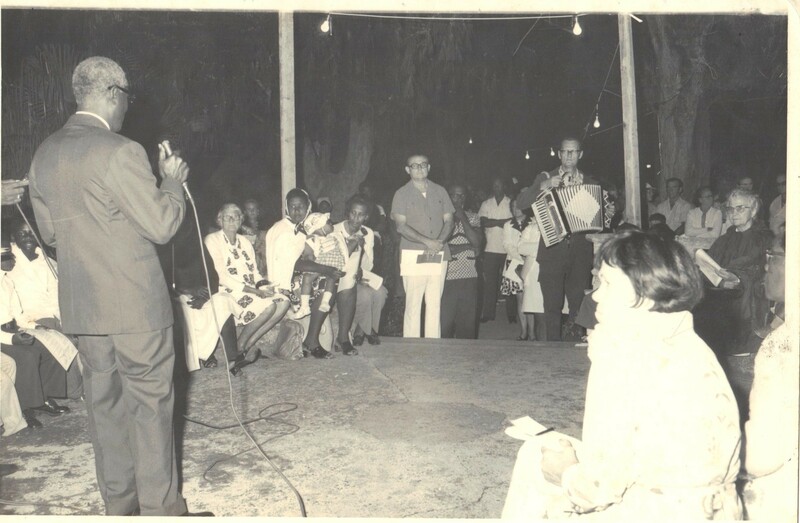 My colleagues were Administrator George Sleeswijk and the late Peter L. “Cessie” Granger who gave their enthusiastic support to the idea. We then put together a Committee with Mr. Ray Hassell (later Senator) as Chairman, Mr. Frank Hassell, Eugenius Johnson and others and we got going. I personally was very worried as to how it would be accepted. We were besieged by financial problems and political intrigue as always. 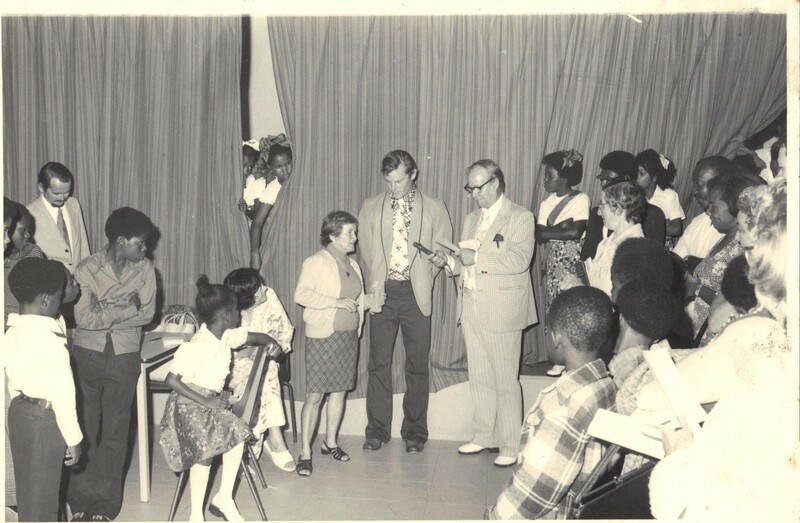 Here is the winner of the “Saba Spice” competition Mrs. Adelle Hassell-Peterson being presented with her prize by Ray Hassell and Eugenius Johnson and to the left Will Johnson who started the Saba Day tradition. In the November 1968 issue of the “Saba Herald” there is a copy of the program which I hereby include. This program will show you what we wanted to achieve. 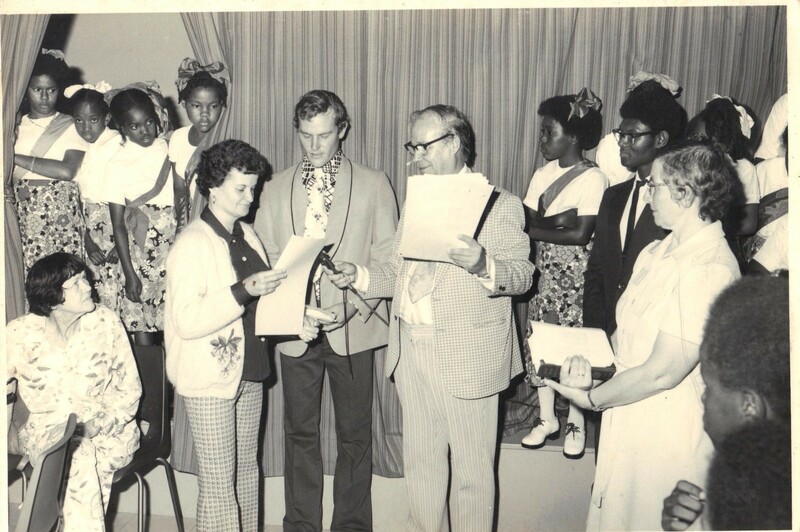 Here is Mrs. Dika Holm-Peterson accepting the prize on behalf of her mother Mrs. Cecile Peterson-Holm, seated behind her is the well known Mrs. Pauline Paul and to her right the Nun Sister Agatha. 8pm. Folkloric activities (Maypole dance, ages 14 and over). 9pm. Results of drawings, stories, poems, Saba Lace and Spice contests. Youth Organizations will perform at the Youth Center (Comedy or Drama) Performing time for each group one half hour. Age factor 9-14. In the park the Rev. Ivan Berkel doing a prayer and you can also see Mr. Frank Hassell, Mr. Floyd Every, Mrs Mathilde Vlaun etc. Click on the image for a larger view and you can see much more. Performance time 8.A.M> – 12 noon. Afternoon 2pm: Running race from the Windwardside to Fortbay. 2.40 pm Donkey Race at the Fort Bay. 3.30pm Tug of war at the Fort Bay. 4.15 pm. Greased pig contest on the grounds of the Lands Radio Station in The Bottom. 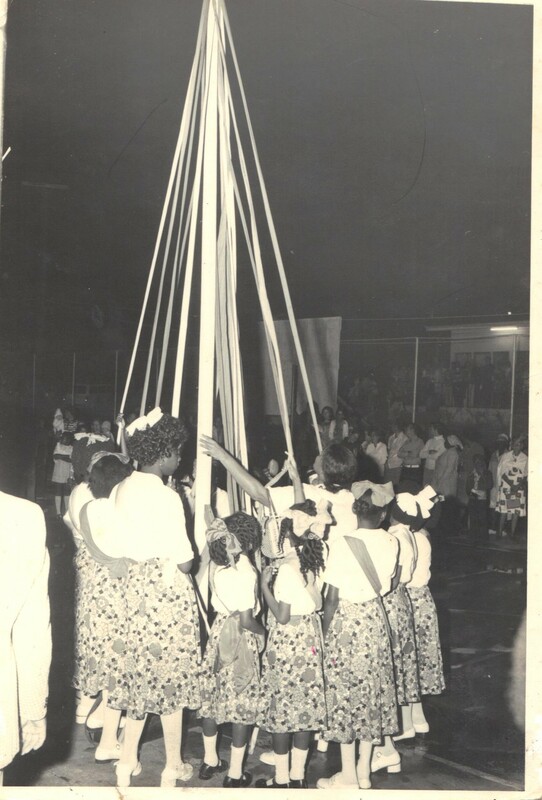 The Saba Boys and Girls Sports Society doing the “Maypole” for the first Saba Day. 7AM – 1PM Spearfishing contest. 9AM – 11 PM: Swimming contest for 14 years and over. 1.30 – 4PM: Domino and card finals. 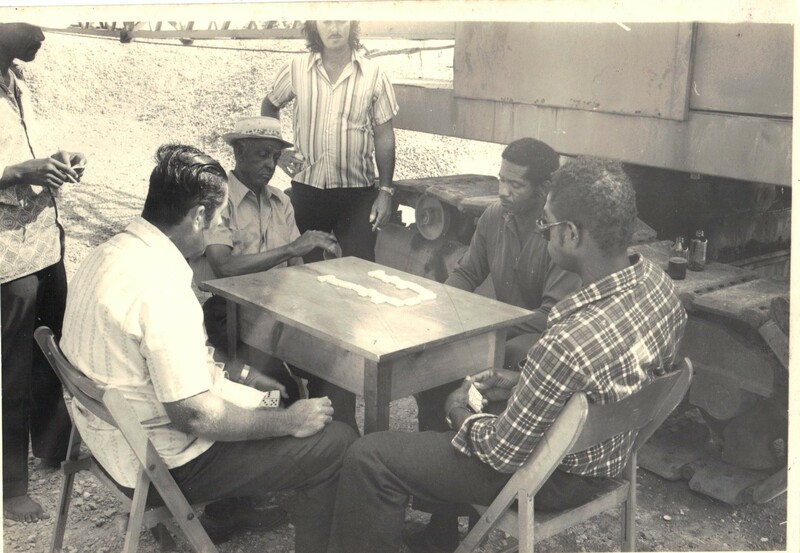 Domino competition at the Fort Bay with Marcus Collins, Alfredo Hassell etc. Additional contests: Stories and poems about Saba for adults. There will also be a drawing contest for school children. Grades 1-7. Also stories and poem contests for school children ages 3-7. Part of the crowd in the Youth Center in The Bottom enjoying the show. Stories and poems of adults should be submitted at the Tourist Bureau in Windwardside or at the Administrators Office in The Bottom. Closing date for admittance November 21st, 1975. 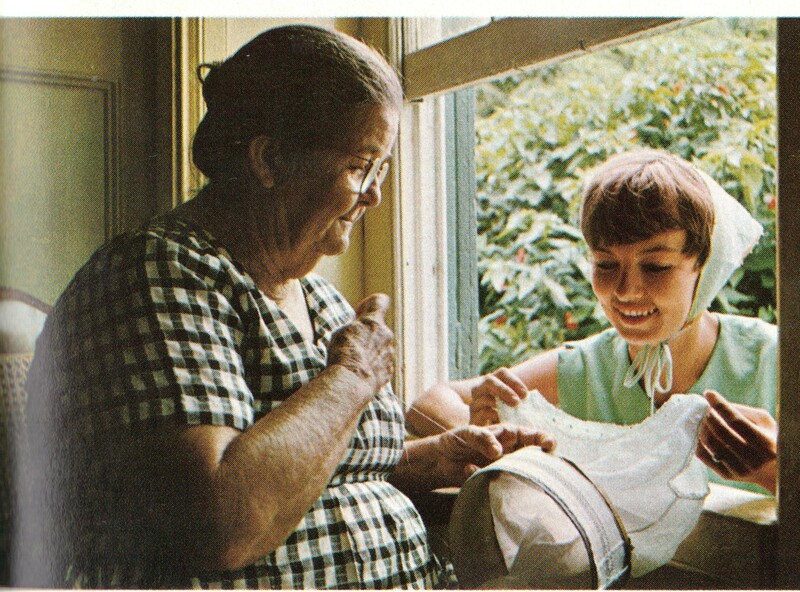 Handkerchiefs: Saba Lace contest Age factors 40 years and over. Closing date for Admittance November 25th 1975. Starting on November the 16th card and domino games will be held in Windwardside and The Bottom. Forms can be obtained in the Tourist Bureau at Windwardside or the Government office in The Bottom. Your cooperation will be needed to make our FIRST Saba Day celebration a success. Mr. Max Nicholson seated who gave so much of his time to broadcast all the events on his radio station. 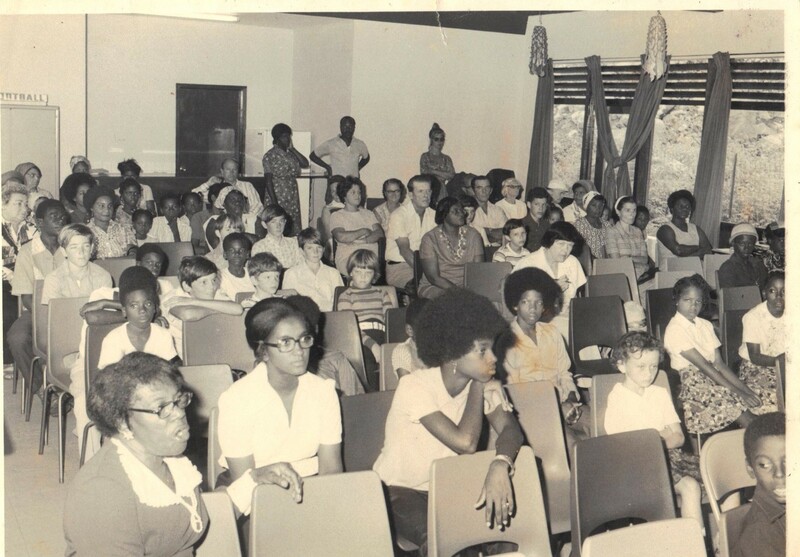 He was my opposition at the time but that did not bother him.In this photo you can also see the Anglican priest Father Aldrick Hassell and others. J.R. Hassell, Director of Tourism. Continuing with the history of that first Saba Day I will quote from the Wednesday December 24th 1975 (Issue #89) edition of the Saba Herald. 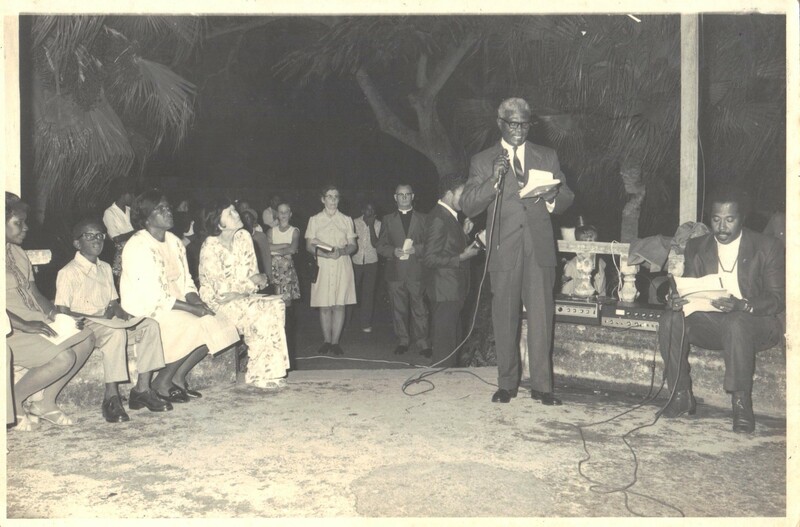 “On Friday December 5th 1975, Saba Day took off to a good start with open air religious services in the Park at The Bottom. 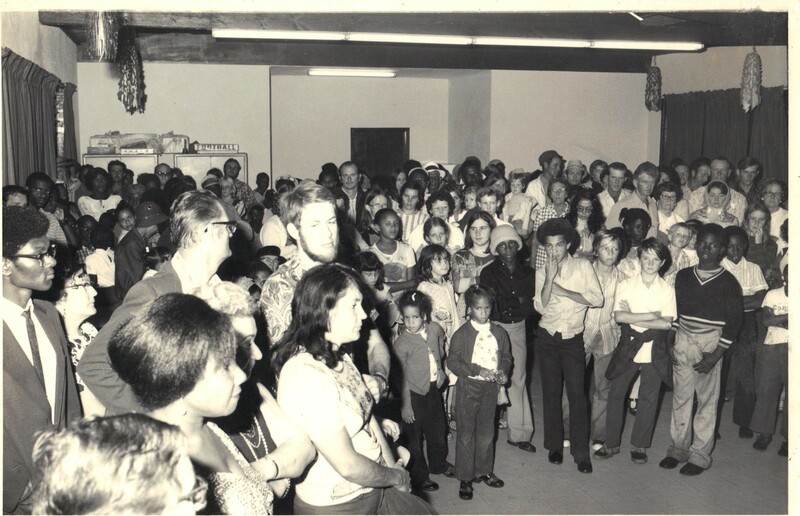 Due to rain these services were continued in the Youth Center, and were followed later by folkloric shows. On Saturday morning the Saba Girls Sports Society, headed by Mrs. Carmen Simmons gave an impressive performance at the Youth Center of how Sabans lived and survived in the old days. This was part of the show put on by Mrs. Carmen Simmons and her group. Mrs. Lizzey Hassell-Donker put on a tremendous act while my brother Guy played the part of the Bishop visiting Saba. In the afternoon there were running races, donkey races and the greased pig contest as well as tug of war. On Sunday there were spearfishing contests, swimming and greasy pole contests as well as kite contest, and card and domino finals. The general public participated in all the contests. A steel band from St. Maarten played all day on Sunday at Fort Bay, and the Government Information Service filmed all the events in colour for television which will be shown at a later date on P.J.F. 3 television station. The Prime Minister has requested them to make an extra copy of the film, so that the Saba Tourist Bureau can use this film for Tourist Promotion abroad. Already people on Saba are making plans for next year. Instead of it being December 5th, the government plans to make Saba Day the first Friday in December each year. The contests next year should include farmers, fishermen and more varied activities. A special word of thanks goes out to Mr. Max Nicholson and his Voice of Saba who made it possible that all three days of festivities were broadcast live over the Voice of Saba. We know that much effort went into making this possible, and it is highly appreciated by one and all. Also a special word of thanks to the St. Maarten business people and the general public over there for their financial aid which made it possible to have Saba Day on such a grand scale. More of the crowd at the Youth Center with many familiar faces. We would like to congratulate all those here on Saba who took part in the festivities, and especially the winners of the various contests. Thanks to your participation Saba Day was such a success that we now can think of making it an annual event. Our thanks go out also to Risdon’s Steel band from St. Maarten which helped to make the festivities even more exciting. Also our thanks go out to the people who gave their time to act as Judges in the various contests. Mrs. Cecile Peterson and her daughter Miss Brenda Peterson. 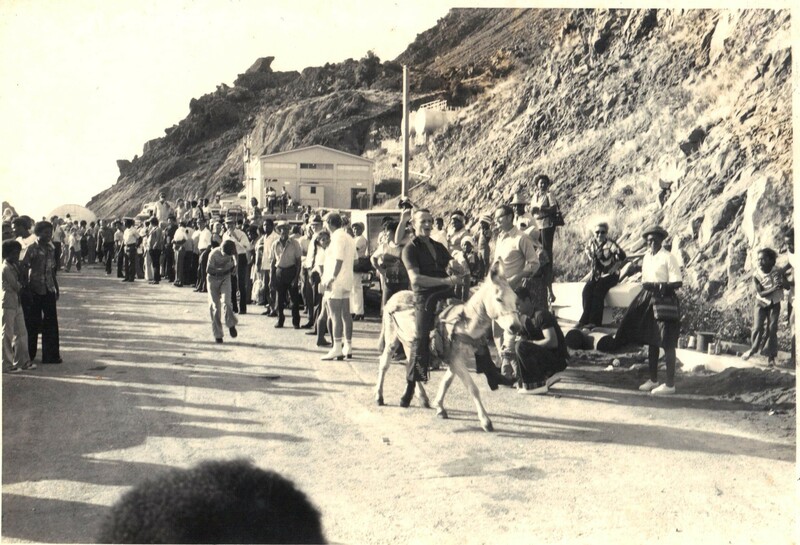 The donkey races at Fort Bay. This is Tarald Hassell of Hell’s Gate. Once again congratulations and thanks for your participation!! our birth, our land our faith. The Occasionals Band with Carlyle Granger on the banjo, Calvin Holm. Dolphie and Eric Johnson and Roy Smith. 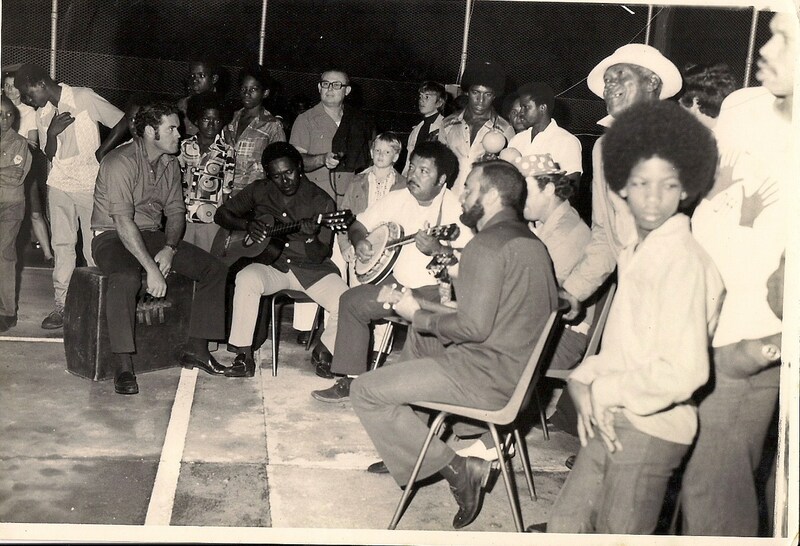 Fred Hassell and others enjoying the music. lives, whether big or small. she reigns an Unspoiled Queen. In 1985 ten yars after the first Saba Day the then Executive Council with Lt. Governor Wycliffe Smith and Commissioners Vernon Hassell and Peter Granger asked me to head a Committee to bring out a flag for Saba Day which goal was accomplished. I had just been elected Senator a few days before Saba Day. 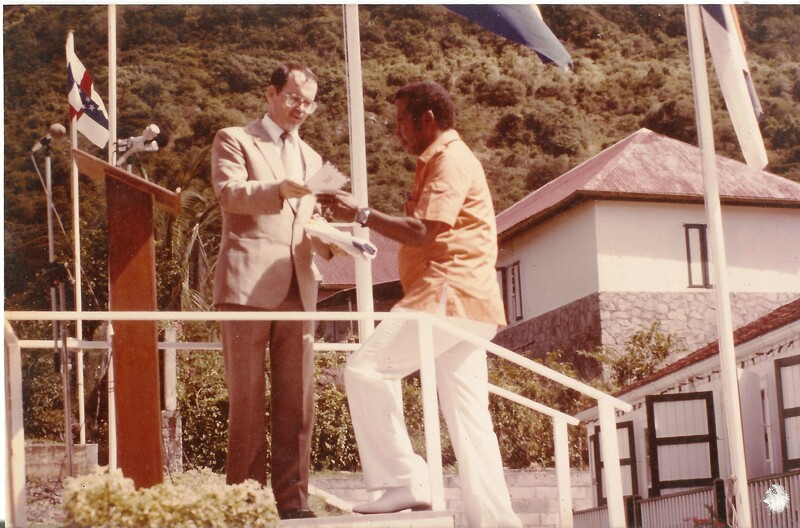 Mr. Chester Wathey gave me a check of fls.5.000.– to present to an organization of my choice and I gave it to the Coralita Foundation for the handicapped started by Mr. Max Nicholson. but not “a might have been”. She’s been the proud possessor. 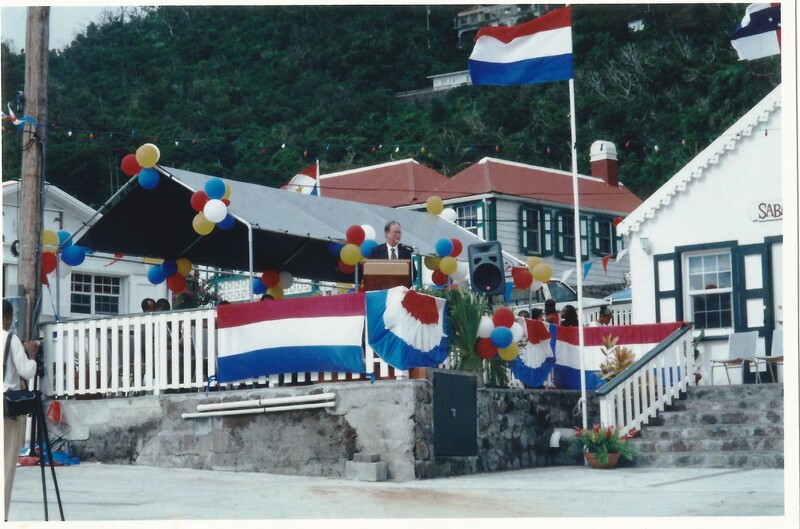 Saba Day 2001 and the opening of the new Tourist Bureau. the chance to have a ball. If prosperity comes from the blue. 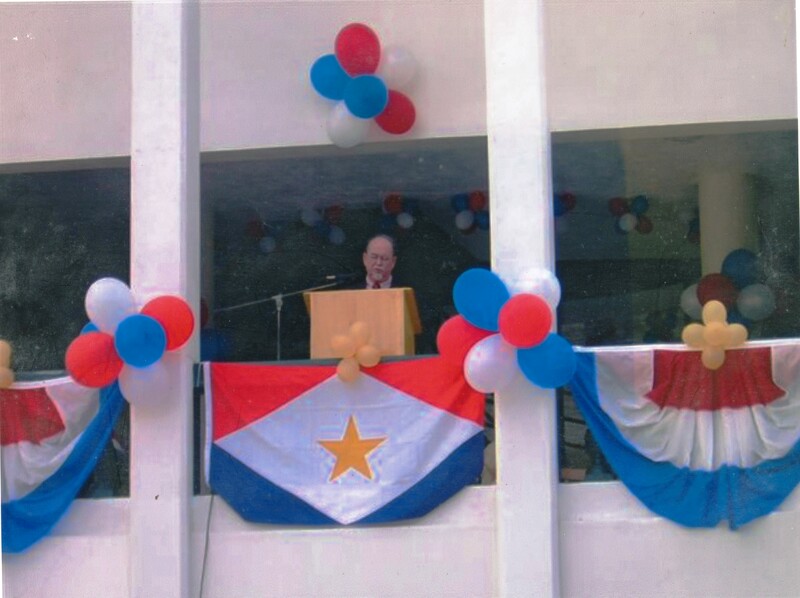 Saba Day 2002 which was held at the Saba School of Medicine. Commissioner Lisa Hassell was instrumental in doing all the work in getting Saba Day off to a great success for the eight years which she served as Commissioner. The mutineer of The Bounty fame. 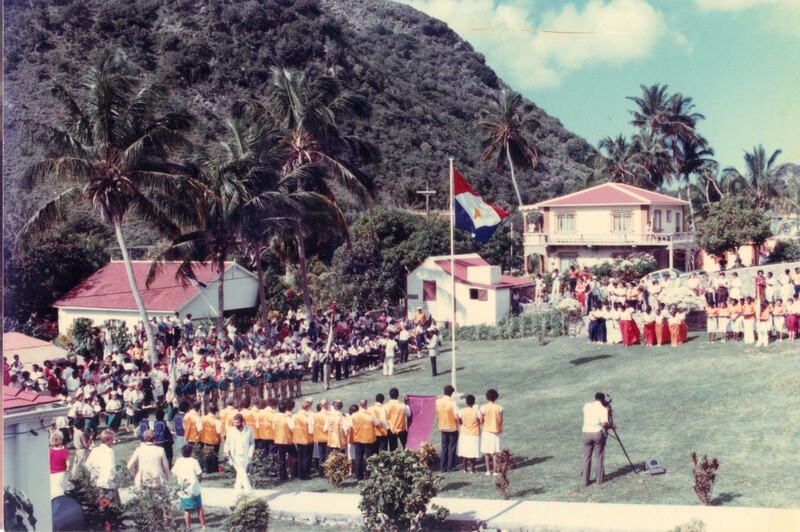 On Saba Day in 1985 Saba’s new flag was raised for the first time. The Island Council of Saba on that same day approved the National Song and the Coat-of-Arms. The flag and coat-of arms were enthusiastically received. Flag designed by Eddie Johnson (18) and the Coat of Arms by George Seaman (81). Some day when I have time I will post some more on “Saba Day” and how it developed over the years and combine that with photos as well, but this one deals primarily with that first Saba Day and how it came about. Enjoy the upcoming Saba Day and make your contribution to your National Day.